The last six months have brought on more changes than backstage at a fashion show. Last summer, I was single and had a job, and with that job came a schedule. It was a little wacky most of the time, but it was still mine. I also had an apartment that I shared with a girl who traveled as much as I did. I had a boyfriend who I saw whenever the moon tilted just so and the stars were in a good mood. I lived in Atlanta, in the good ol’ US of A, where there are at least two Starbucks for every street or place named Peachtree. Now I live in Vietnam. I have a different last name. I don’t have a job. I don’t have a schedule. I share an apartment, a home, with a husband who doesn’t pack a suitcase anymore. I have more free time than any person over 5 and under 65 should have. 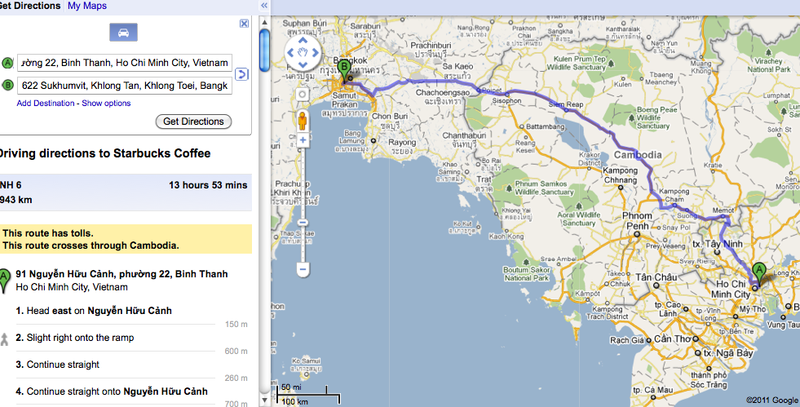 And, the nearest Starbucks is in Thailand; an easy 943km (586mi) drive through Cambodia from here. Take all of that, throw in a massive language barrier and their affinity for sweet, iced coffee, and you have yourself a grand ol’ change. I think, in fact, it deserves a capital C – Change. I’ve always known that I’m a night owl. Or maybe I just don’t like getting up early. Jonathan isn’t as much of a night owl as I am, but he isn’t exactly out there snagging the early bird’s worms. Ever since we got here, though, he has requested the morning shifts. I understand the thought process behind this – get your day going early so you finish early, avoid the trickle down delays that come in the afternoon, avoid afternoon thunderstorms… There are plenty of good reasons. Regardless of his duty in (the time he has to be at the airport,) he likes to give himself an hour and a half to get ready. This isn’t because it takes that long. He just doesn’t like to rush – something else I can appreciate. Just not at 4am, and not for me. So, for the last few months, he has been getting up, having his coffee, catching up on news from the other side of the world, kissing me goodbye, and going to work. Rarely am I even aware he is awake until he is bidding me farewell. So I can’t really complain about the early schedule. When he has to get up this early and I’m not tired, I generally try to be quiet so he can sleep. I try not to push him to do things in the evening after he’s been awake for 16 hours. I remember what it was like to get up that early and work long days – how you can be so tired you can’t even string words into a sentence. And, I appreciate the fact that he is responsible for a great many people’s lives (including his own,) and want him to be well rested. I read, write, or chat online until I’m ready to sleep. This was working until one night recently when our schedules overlapped – going the wrong way. I was still awake as his alarm went off for work. This made me realize that I needed to make some changes. My night crossing with his morning coincided with me reading “What No One Tells the Bride” by Marg Stark. She married a naval officer and moved several times early in their marriage. He spent a good portion of their first married years away on a ship. And, she is a writer who previously marched to her own drum. She, if anyone, can identify with the unusual life that we lead. She touched on the effort it takes to coordinate schedules – if for no other reason than wanting to have a reasonably coherent conversation at dinner. I was also becoming frustrated with my lack of productivity. Just because I don’t have a job doesn’t mean I don’t have a lot of things I want, and need, to do. But, as I said before, I am not a morning person. It’s not that I don’t like the mornings. I think they are quite nice and pretty. I like being able to accomplish a few things before noon. But, it is so hard for me. I have come to the realization that without some external force, I will sleep past 9am every day. So now it’s my turn for an experiment (and one not involving water-borne bacteria.) I start my day when Jonathan starts his. It sounds like a terrible, heinous idea, but three months of being a lazy retiree are enough. Drastic measures must be taken. But, how in the world will I ever get up before 4am? Can you see the angelic glow emanating from the press – the halo of goodness hovering overhead? I’m not sure why it isn’t mentioned in the Bible, but I’m pretty sure that before God said, “Let there be light,” He said, “Let there be Starbucks.” How else could He have accomplished all that in six days? Thanks to a good friend back home, we are the proud, sane, and happy owners of a French press and a coffee grinder. 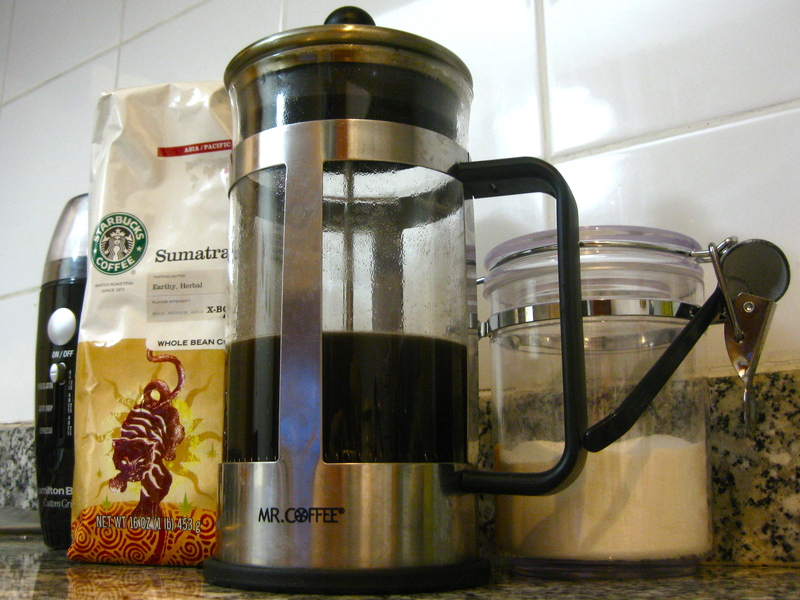 Vietnam may be the world’s second largest exporter of coffee, but Jonathan is Starbucks’ largest importer within Vietnam. A bag of coffee beans is his only request when anyone travels between here and the US. He knows that it is vital for his, and now our, happiness. He also knows that if that early bird is going to live to see another sunrise, if there is the slightest chance that I will actually follow through with my goal and get up, there must be coffee ready for me. And there always is. (Thankfully, it must be made with boiled water so there can’t be any more tap water experiments.) Sometimes he even brings my glasses to me to make sure I can find the coffee cup. Spilling coffee would be wasting coffee and that ranks among the most evil deeds imaginable. I’ve done it six days now. Not consecutive ones, but still six. Thankfully, he doesn’t get up that early every day. Some days he works the late shift, and he rarely works five days in a row. I don’t think I would have ever conceived such a ridiculous idea if that were the case. So, here’s to Starbucks! Thanks for helping me see Saigon wake up, get things done, AND enjoy dinner with my husband. I have a feeling some of you are saying, “Forget squid fishing. THIS is the worst idea ever.” What do you think? ← Calamari? More like cala-SORRY! As a person whose alarm has gone off at 3:50 am 5 days a week, for the last almost 14 years (except for my very generous vacation/holidays that my Employer allows) I totally think it is a great idea!! I do love my days off when I can sleep in until 7:30 am and then get up and enjoy a great cup of coffee…. I don’t know how you do it for so many years. Do you like it or has it just become habit? I enjoy the occasional early morning, but also take great comfort in knowing it’s not every day. I don’t really love it at all, but in my job there are only 2 shifts, and the evening shift is not conducive to any family life at all! I do love having my afternoons free, and getting to bed by 8-9pm is not that terrible!! great post. Glad I found you from a comment you put on my site this week. Congrats on the marriage and the move. Vietnam is great. And you are lucky you are at least in a country where you can find reasonable coffee. Been in far, far too many were instant is my only option. The horror… the horror. Great to hear from you 🙂 Instant only is truly a horror. I don’t know how people who live in those places ever get anything accomplished or have any joy in life. Okay, maybe that’s a bit extreme, but I know it would be tough for me. Thank you. Believe it or not, getting up early is starting to grow on me (not that I would do it if Jonathan wasn’t.) I have been getting a lot more done, and can enjoy the rest of my day knowing I don’t have all those tasks hanging over my head. I totally understand what you’re saying – my husband’s alarm has gone off at 4:17 am for the last 18 years. For the first 12, I got up with him. But after baby #3, I had to give it up. Just couldn’t do it, especially since baby #1 was now staying up later than my husband! But it was good while it lasted – I must say I’m really looking forward to his retirement. Even though it’s at least a decade away, I already dream of us being on the same schedule again.